Simple Man Distillery partners with local farmers to produce innovative world class farm-to-glass spirits. Each bottle of Vodka FROM Peaches and Grains contains over 50 peaches grown at Dickey Farms in Musella, GA, not "flavored" with syrup or artificial additives. As a fifth generation centennial farm, Dickey Farms peaches are known and shipped throughout the world. It is mellowed out with wheat to ensure that there is no sweetness, just a sliver of a note of natural fresh fruit. 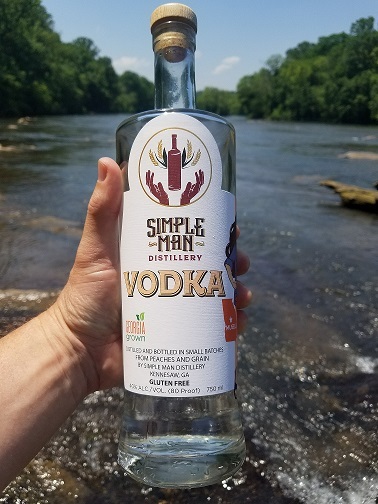 Simple Man Distillery only makes vodka seasonally from fresh peaches and once those are gone, we must wait till next season. Enjoy it while it lasts! Certified "Georgia Grown" by the Georgia Department of Agriculture. Distilled twelve times.